This Baked Zucchini Parmesan is super easy to make, naturally vegan and gluten free from simple ingredients. It is the perfect family recipe, comfort food. 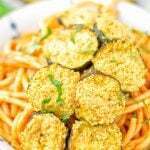 Also a blast as Zucchini Parmesan Crisps – you see, it’s a versatile recipe that will become everyone’s favorite. Prepare the Vegan Parmesan Cheese (3 ingredients, 1 min) by just pulsing cashews, garlic powder and nutritional yeast in a blender. Season with salt and set aside. Next, combine olive oil, garlic plus optional garlic powder, and give it all a short swirl with a fork until everything is well mixed. Now use a pasty brush and spread each zucchini coin generously with olive oil, then sprinkle with vegan Parmesan. Bake on a baking sheet prepared with parchment paper will take around 20 minutes at 410°F.